Four friends growing up in Oslo in the sixties, who occasionally think of themselves as the Fab Four. Based on the best selling book by Lars Saabye Christensen. Four teenage boys come of age in Oslo at the time when Beatlemania hit Norway. Kim, Gunnar, Ola and Seb each take on one of the Fab Four's names and plan to start their own band during a time of great political upheaval. At the same time, they blunder through their formative years in ways all at once endearing, entertaining, and heartbreaking. The boys struggle with archaic textbooks and ancient teachers, attempt to be rebellious, and, of course, discover girls. 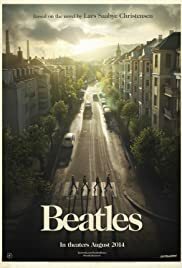 Based on Lars Saabye Christensen's beloved bestseller of the same title, Beatles hits all the right notes with a familiar soundtrack (scored by Magne Furuholmen, keyboardist of the synthpop/rock band a-ha) and nostalgic recollection of losing innocence and the importance of friendship. Beatles is a story about five 15 years old friends growing up in Oslo at the same time as the band Beatles releases the "Sgt. Pepper's Lonely Hearts Club Band"-album. Fascinated by the Beatles, they decide to start a band. The film is moist of all a store about growing up, based upon the novel by the well known and immensely popular novel by the name by Lars Saabye Christensen. The book is very much loved by many, and so many of Saabye Christensen's novels has been developed into great films. I'm sad to say this opportunity is lost in this film. Of course it's impossible to fit the brick-sized novel into a 2 hours film, and as such it's not bad. The time colorization is great as well, and obviously the music, which is, believe it or not, not only by the Beatles. Composer Magne Furuholmen (former a-ha) has made a great score and the band Hvitmalt Gjerde does as well. The cast is good. The boys chosen are charming, with focus on the Kim Karlsen-character, played by Louis Williams, which is a real charmer. But are they instructed well enough? Well, I'll be back to that. First of all, I think this film will be loved outside Norway in a much larger scale than for those who have read the novel, and are watching the film without knowing the story in beforehand. So why this? The film's biggest problems is the instruction ad dialog. I guess foreign watchers won't feel this, but as a Norwegian I can't help thinking some of the dialog, especially when Kim Karlsen's character is speaking, feels forced. It's simply not natural, and to much "eehms". I was doubtful already when i heard that Danish Peter Flinth took over the project, from Espen Sandberg and Joachim Rønning, simply because I've failed to find any of Flinth's films memorable. "Arn" was simply awful, due to the same - bad dialog. And it's not the script, it's the way the dialog is spoken and the way the young amateur actors are instructed in saying them. Maybe the problem is that Flinth is Danish, and not able to get all the nuances in the Norwegian language? So if there wasn't anyone to put the foot down, then this ruined it. Another problem is that the film is rather boring. Cozy, OK, but there's something about the pace, and with the character up-building which doesn't function. We don't get to love, only just like the characters, and this is a cardinal sin in a film like this, and especially in a story by Saabye Christensen. A main thing would be to focus enough of the four main boys in the start to make us sympathize with them. Unbelievably enough I found this hard. All we're left with then is a nice, sweet story about some boys we don't really start caring about. Being one of the most acclaimed Norwegian novels, and not succeeding in this, is a travesty. There's so much great work put into this, so i pity that this is probably going to bomb in the theaters due to mediocre critics. The novel deserves better.